Manage your cities growth, its building and balance your resource to create an efficient workforce to expand your city. Earn Forge Points to invest in technology on the extensive research tree and unlock new technologies and methods that will yield new buildings, units and boosts for your growing empire. Raise a mighty army and march them across the land and take what you wish with force, doing combat with the AI in the single player campaign, or even matching your tactics against friends and other players. With the hex grid battle maps the turn based combat the battles in Forge of Empire are extremely tactical, match your units up wisely against your opponent and take advantage of the terrain features such as trees and hills to gain offensive and defensive benefits. 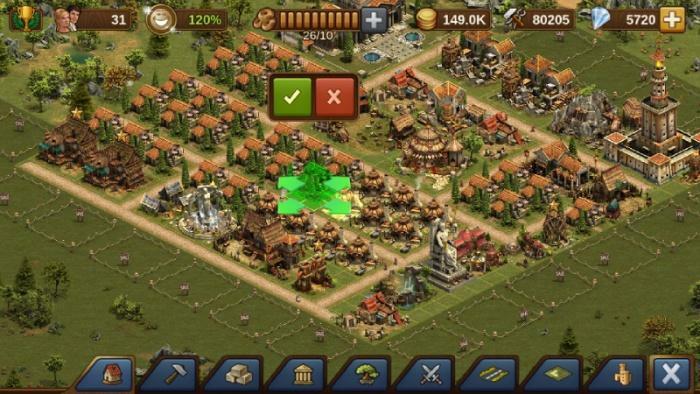 “Diamonds” are used as the games premium currency, available to purchase with real money, Diamonds will give the player a number of benefits and allow them to rush production, gain more technologies, buy unique buildings and much, much more.